Paul Carrillo is an Associate Professor of Economics. He joined the Economics Department in August 2006. His research interests are in applied microeconomics, in particular, urban and real estate economics. 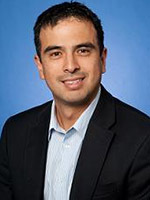 Dr. Carrillo's current research focuses on explaining the search process of buyers and sellers in the housing market, the measurement of residential rental prices, and the design of cash-transfer programs in low income countries. He received his BS in Economics from the Universidad Catolica del Ecuador (1998), his MA in Economics from the University of Virginia (2002), and his PhD in Economics from the University of Virginia (January, 2006).